This beautiful sunny weather has been dreamy! I am going to absolutely make the most of it, because lets face it – this is England. Who knows how long this is going to last! The thing is, in beautiful sunny weather I get massive cravings for iced desserts. Obviously gorging on ice cream is not going to make me feel good! So I wanted to make a delicious iced dessert recipe that wasn’t going to be laden with artificial rubbish! I had about a quarter of a pot of homemade yoghurt left and wondered what would happen if I literally just froze it. You know what? 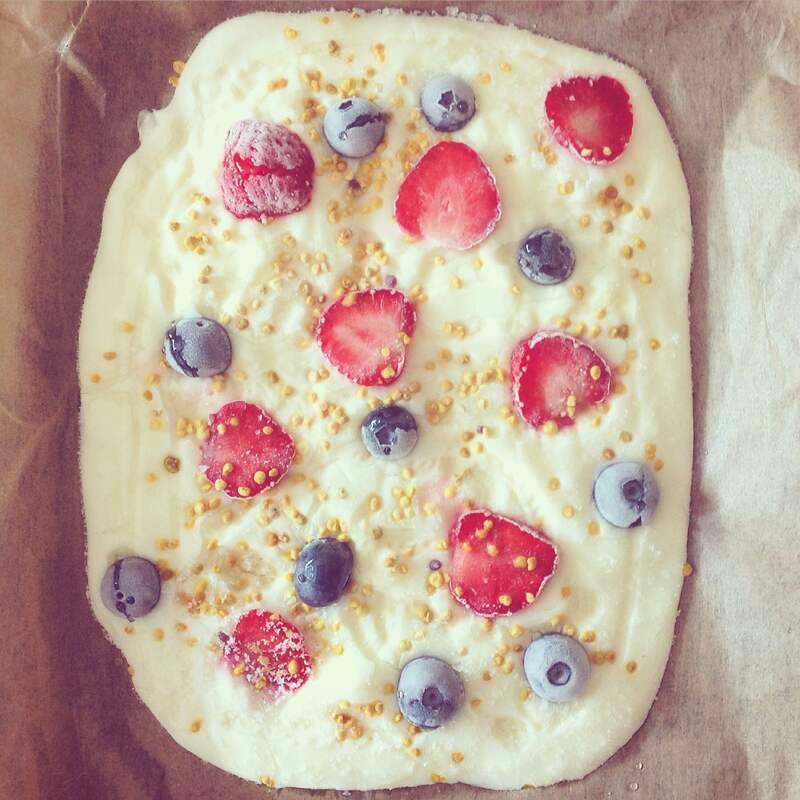 Delicious things happen if you freeze yoghurt – who knew? It was super easy and these bars looked so so pretty! I sweetened my yoghurt with honey, but you can leave it as it is or use whatever sweetener you want. I would recommend using a liquid sweetener as I think granulated sweetener would produce a grainy texture. I like making simple recipes, I also like making recipes that can be altered to suit your preferences. This is definitely one of those recipes. You could use soy yoghurt or any other form of dairy-free yoghurt , and swap in your favourite berries! I used fresh blueberries and strawberries because they are in season right now and provided a natural sweetness! Bee pollen is a great addition to the bars as they are packed with nutrients and they look so pretty. You should never use bee pollen in hot recipes as this will kill the natural nutrients and vitamins found in bee pollen. This recipe makes around 8 largeish bars, they can be kept in the freezer until you need them! If you do have any left you can always add them to smoothies for a creamy, fruity twist! One flat baking tray lined with baking parchment. 250g of your favourite yoghurt . I used plain yoghurt . Mix the yoghurt and the honey in a bowl until combined. Spread the yoghurt mixture onto a baking tray, don’t worry about being too neat. I think it looks rustic if it isn’t too even. Dot your berries over the mixture, scatter the bee pollen over the whole thing. Put in the freezer for at least two hours, preferably overnight. Take out, slice into bars and serve! Store in the freezer if you have any left! Instead of dotting the berries on to the yoghurt, blend all the ingredients and make little frozen yoghurt drops! If you have an ice lolly tray. Blend all the ingredients and pour into the moulds for a frozen iced lolly dessert! Add one bar into your morning smoothie! Blend the mixture and use it to coat bananas. Freeze for a healthy and fruity treat! Frozen yoghurt is definitely the way forward! Let me know how you make yours! Comments below! Happy Sunday everyone! 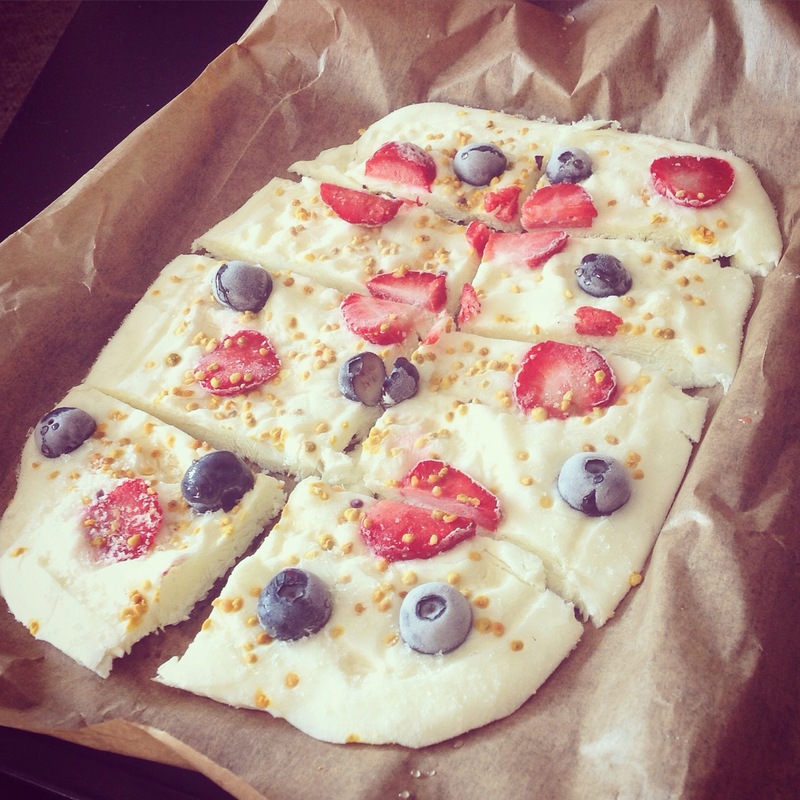 Posted on July 12, 2015 January 10, 2016 by TinaManahaiPosted in RecipeTagged beepollen, berries, cooldown, dessert, frozen, fruit, Healthy, snack, summer, sweet, Vegetarian. Next Next post: Macaroon Masterclass!